Do you ever just stop and stare when you see a photo of food? Well I do. Even before I saw the photo, I saw the name of this dish in my blog roll and saw that it was posted on the Proud Italian blog. I knew it something I would have to try. I roasted extra sweet potatoes on Saturday night and while the oven was going I threw in some butternut squash and cauliflower to roast. 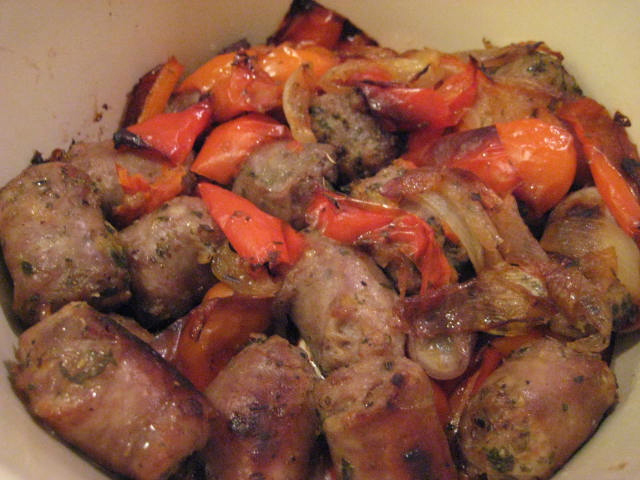 I did add meat to this, some spicy Italian sausage. Not your hum drum daily fare! 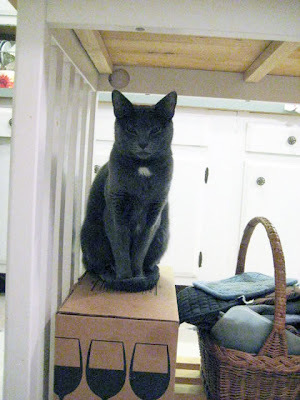 I am going to start adding a feature which I first saw on Smitten Kitchen. I always thought was a very cool idea. Smitten Kitchen was the first food blog that I read. When I saw read the blog I was blown away. I thought it was an amazing idea. At the time I did not think I could ever have a food blog. Oh I wasn't blogging then! Back in October I made Pasta Fagioli. I had some in the freezer and all I had to do was add the cooked pasta. We had almost no leftovers! I brought some over to my Dad's. I am pretty sure he will like this. We had some of the bread I made yesterday. This batch came out much better than the last time I made this bread. Practice, practice practice. And speaking of bread you may notice a new button over there on the right. BYOB-Bake Your Own Bread. This is going to be fun! I love baking bread. I just wish I had found out about this earlier in the month. I could have posted the Marble Rye and Pain l'Ancienne. And the English Muffin Bread. Oh well there is always next month. Ratatouille Sauce! Yes you read it correctly. I was at the Food and Wine site the other day and found the recipe, Linguine and Ratatouille Sauce. In the description of the recipe it is mentioned that the sauce would go nicely "on a hero with sausages." Bingo. Sunday night dinner! Wow it was good. Messy but good. and for breakfast Lemon Cranberry Muffins. Keep it simple Friday. The onions and peppers were roasted on Sunday and went very nicely with the rye bread and cheese. Some Dijon mustard on the side was all the sandwich needed. We also had some Italian Wedding Soup that I had in the freezer. Love the little meatballs! Yes that is the brand of tomatoes I use in my mom's meat sauce. See blog entry from January 5. And dinner tonight was my mom's pasta sauce with penne. I found this recipe on What's Cookin' Italian Style Cuisine. I love eggplant. I love spinach. I love ricotta. And who doesn't like Sinatra! About a week ago I was checking out food blogs and I stopped in my tracks. There was a photo of a bowl of Minestra that looked exactly like what my mom use to make. I was very happy because I did not have a copy of her recipe. I used a beef shank, pork spare ribs and a nice end piece of prosciutto. The greens were escarole and swiss chard. It tasted just like my mom's. I am so glad I found this recipe on Cooking with Giuseppe. And I was glad I could share with Chris a dish that I grew up eating. Kind of an important game tonight. More on that later. These calzones came out great. The crust was delicious and the fillings were perfect. I roasted red peppers and onions this morning and I sauteed some spinach and fresh tomatoes. I made one calzone with peppers, onions and bacon and the other with peppers, onions, spinach and tomato. Now back to that game... The Giants win! The Giants win! I have been wanting to make the Acorn Squash Farro Risotto for some time now. Today I happened to have all the ingredients in the house. Of course I thought that it would not be enough to have just that for dinner. So I also made the Chicken Schnitzel. The Acorn Squash Farro Risotto was more time intensive, about and hour, so the Chicken Schnitzel was a perfect recipe. It took only 15 minutes. And I used one half of a chicken breast so the amount was just enough. 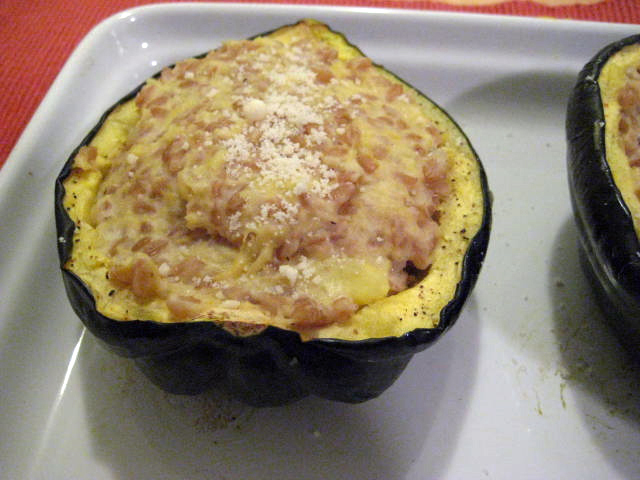 Now back to the Acorn Squash Farro Risotto. I cut the recipe in half... except for the farro. Making only one squash, the recipe calls for two, I should have used half the amount of farro. We ended up sharing one of the acorn squash halves, they are very filling. We loved the nutty flavor of the farro. And I have enough for a couple of lunches... unless we have it tomorrow night! And it snowed today! First snow storm since October. When it snows I have to bake bread. I do not know why but I just do. I tried a new recipe today. English Muffin Toasting Bread. I found this on the King Arthur Flour site. Mine did not rise as much as the bread in the photo on the King Arthur site but I loved the taste. It tastes like an English Muffin! On a different note... Are there any knitters or crocheters out there. Well I found this very cool site. Biscuits and Jam. There is a Stripe Generator! You pick out your colors and the number of rows you want and it shows you what your striped pattern will look like. Very cool. For some reason I wanted Swiss Chard for dinner tonight. 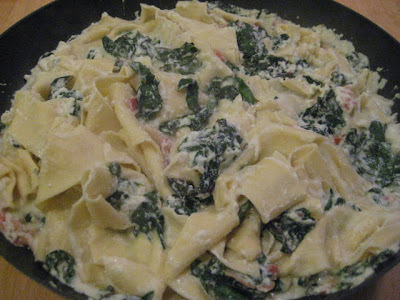 So I googled Swiss Chard and pasta and found this recipe on Cinnamon Girl Recipes blog. I could not find the pasta at the store so I made my own. I used the recipe from Giada De Laurentiis, Everyday Pasta. There is nothing better than homemade pasta. Here is the recipe. I cut this recipe in half and there was plenty for the 2 of us. Place the flour in the bowl of a food processor. In a small bowl, lightly beat the eggs. Add the salt and olive oil to the eggs and stir to combine. Add the egg mixture to the food processor with the flour and pulse to combine the ingredients, scraping down the sides once or twice. Continue, with the machine running. until the liquid is evenly distributed, about 1 minute. The dough should stick together if pinched between your fingers and be cornmeal yellow in color. Some of the dough will be clumping together, but it will not form a ball. Turn the dough out onto a lightly floured surface. Gather the dough into a ball and knead gently until the dough is smooth. Cover with plastic wrap and let rest for 30 minutes before rolling and shaping as desired. Lucy loves to watch me make pasta! So for the rest of the dinner I followed the Cinnamon Girl recipe. Only change was I added some bacon, you welcome Chris! Did it need the bacon? No! We both loved the meal. And with Lent coming up and we try not to eat meat on Fridays this recipe will be repeated, no bacon of course! The recipe is from Lidia's Italy site. I made the Minestra base a while back and put it in the freezer. I picked up a butternut squash at the store and cut it into 1/3 inch pieces. I added it to the base which was put in a pan and brought to a boil. Covered the pan and cooked for 30 minutes. Perfect meal for a January night. And yes we will be having the leftovers tomorrow night! Have you checked out the site Cookstr yet? It is a site that is a collection of cookbook recipes. Between that site and Pinterest I could easily get lost for a few hours! 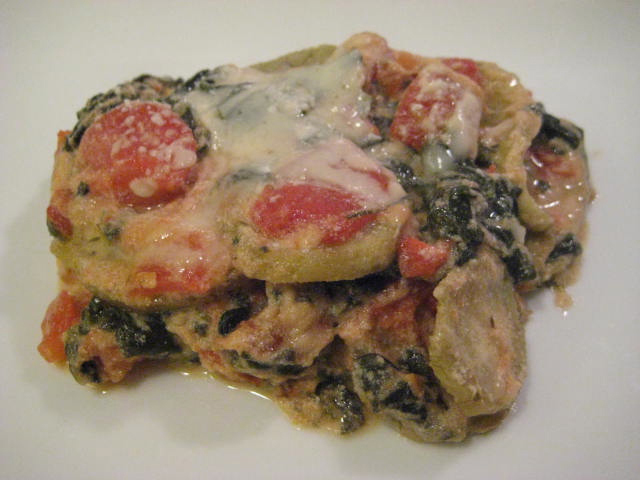 So I found this amazing recipe on Cookstr. Baked Rigatoni with Tiny Meatballs. This recipe is from Marcella Hazan. The changes I made were using Penne instead of Rigatoni, not a big change. This was a rib sticking meal. Very filling. Perfect for a cold winter's night in front of the TV watching the Giants beat Green Bay (but sadly I had to say, "Maybe next year for the Saint..."). Okay they can't all be winners. This was not bad. But I can say it. It was boring. The shrimp were tasty. Unfortunately I had to use frozen mixed vegetables, no time to run to the store to buy fresh ones which I am sure would have made all the difference. And the couscous was very good. I tried a different brand. Lundberg Roasted Brown Rice Couscous. I liked the nutty taste. And their website has a lot of recipes to try! Okay. Here it the deal. During the winter, once a week we have Pasta with Meat Sauce. Not just any meat sauce. The sauce is the sauce my mom taught me how to make. 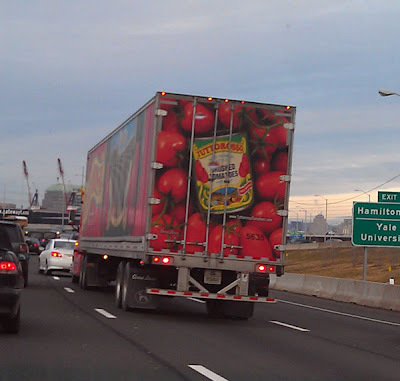 Last week I announced my choice in canned tomatoes was the same as what my mom had used, Tuttorosso Crushed Tomatoes. I have been going through the blog posts and looking to see if I had ever posted my mom's recipe. I don't think I have. Heat olive oi in large pot. Add garlic and chopped onions and saute for 5 minutes. Add all the meat. Cook over medium heat until browned. Meat does not need to be cooked through. Add tomatoes and simmer covered 30 minutes to 1 hour. Add tomato paste to thicken, adding 1 tbsp. at a time as needed. Add herbs, salt and pepper and simmer for 10 minutes. Add wine, cover and simmer 10 to 20 minutes. Remove clove of garlic and let cool completely. Remove any grease from the top of the sauce. Freeze extra sauce in containers or zip log bags. I had a half day at work today so I was able to throw this one dish wonder in the oven before Chris got home and 45 minutes later dinner was served. The bread I served with this, and you have to have bread as the sauce is amazing, is the bread I made on Sunday. Yum! Do you need this Jamie Oliver recipe? Well Click Here! Did you you know today was National Hot Toddy Day? So it was the day after Christmas and I was looking at a lot of leftover Roast Beef. I was in the same situation a couple of year ago on the day after Christmas. What did I do... I looked at my archived recipes on this blog! I found this recipe from back in January 2010. I made enough for a couple of meals and put them in the freezer (!!!). Fast forward to tonight and dinner is served! Once again the freezer is my friend. I made this meal on New Year's day and popped in the the freezer. I found the recipe for Beef and Quinoa Meatballs on the Whole Foods site. I had all that fantastic sauce leftover from the Osso Bucco. Meatballs were the perfect addition. And this recipe seemed like a good way to stretch the meat ($$$) and also cut down on the amount of meat we are eating. And we both like Quinoa. This got two thumbs up from both of us. Let's start at the beginning. This past week I was on the Food52 site and came across a bread recipe. Pain a l'Ancienne. I had to make it. So I started the dough yesterday morning. The first two loaves did not come out as nicely shaped as I would have liked but the next to were spot on. This dough had great texture. And I liked the addition of Wheat Germ. Then there was a recipe on another blog. Food Wondering and Marbled Rye Bread. Yes I made this today. It looks so cool. Hopefully Chris will like it in his lunch tomorrow. Such an easy recipe to follow. So what was for dinner... well seeing I was into the flour I made pizza dough. 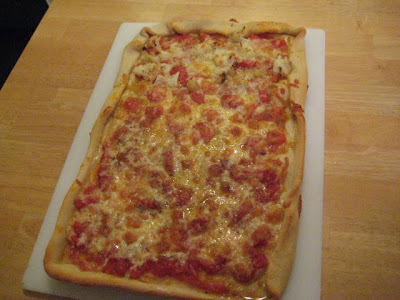 Half of the pie was just canned tomatoes and cheese. The other half was the leftover tomatoes from last night's chicken and some roasted cauliflower. We ate the whole thing! Kind of an important game tonight so I wanted an easy meal. Chicken Cutlets with Tomato Sauté was easy and delicious. 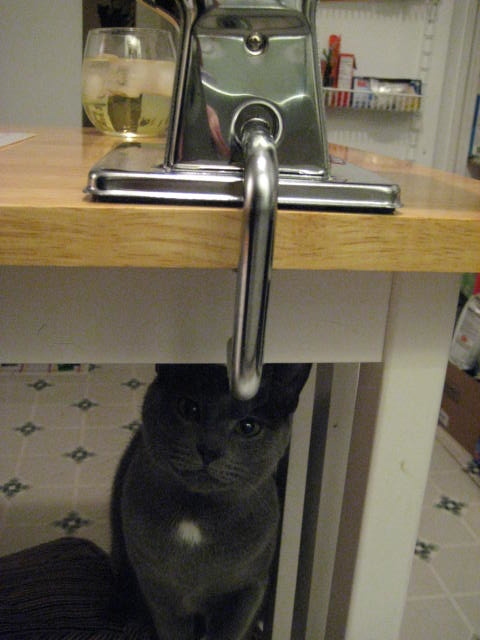 I found it on RealSimple.com. From Real Simple. I loved this. Chris loved this. But Archie... he was in heaven. He was definitely into the fish. And yes the fish was great. But I liked the potatoes, of course! Under the heading of too cute. 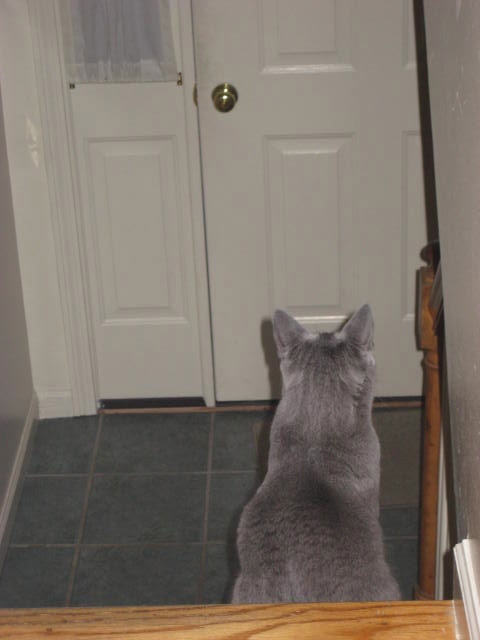 I got a photo of Lucy waiting for Chris to come home! This could be wordless Thursday. But I will type a couple of words. My mom's recipe for meat sauce. Gosh I can't think of anything else to say. Oh one thing. I have finally decided on a canned crushed tomato to use in this sauce. Tuttorosso Crushed Tomatoes. It is the brand my mom used and I have tried all the other brands but Tuttorosso Crushed Tomatoes gives me the taste I remember. Gosh I think I did my first product endorsement! I knew I was going to be making this on Saturday when I made the mashed potatoes. I thought ahead and made sure I had enough leftovers for this dinner. This is so simple to make. It's just browned ground meat and then add veggies. Usually I use frozen mixed vegetables but I did not have any! So I chopped up some carrots and those leftover green beans from Saturday night and the lonely zucchini. Sauteed it, seasoned it and put it in a pie plate. Topped it with the mashed potatoes and baked. See I told you it was simple. Today would have been my mom's 91st birthday. She often made Shepherd's Pie for me. When Chris and I were first married we ate her food at least twice a week. She would pack up "care packages" for us. She was too funny! And I do miss those "care packages".